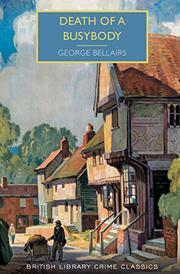 In his vintage reprint from 1942, Bellairs, the pseudonym of prolific Harold Blundell (1902-1982), asks who murdered a heavy-handed gossip whom everyone in the Suffolk village of Hilary Magna probably wanted dead. No matter what your business is, mercantile or personal, it’s Ethel Tither’s business too, and she’s full of strongly moralistic opinions about how you should be conducting it. So when her body is pulled from a cesspool where she drowned in only a few inches of water after being knocked unconscious, the villagers are more shocked at the manner of her death than surprised that she was killed. Bellairs’ regular sleuth, Inspector Thomas Littlejohn, sent from Scotland Yard to help Inspector Oldfield, of the Trentshire Constabulary, finds that he can’t sit down to a cup of tea or a pint of lager without hearing the locals implicate each other. Miss Tither’s death makes her cousin, the Rev. Athelstan Wynyard, a wealthy man and frees her maid, Sarah Russell, to marry shepherd Walter Thornbush without losing the annual payment she received from the estate of the busybody’s late sister. Shortly before her death, Miss Tither had rebuked Polly Druce, a kitchen maid at Hilary Hall, for seducing married farmer Edward Weekes and given ear to a devastating rumor that her clerical cousin was a shipping clerk, not the evangelizer he’d claimed to be. Given such a rich field, agreeably unspectacular Littlejohn stoically resigns himself to checking alibis, questioning forgettable suspects, and dropping by the pub for another round of drinks and gossip, though the latter won’t be the same in the absence of Miss Tither. The plotting is routine, the characterization perfunctory, and the surprises modest. But Bellairs’ dryly ceremonious wit, which shines from the very first page, helps explain why Anthony Berkeley, aka Francis Iles, was such a fan 75 years ago.